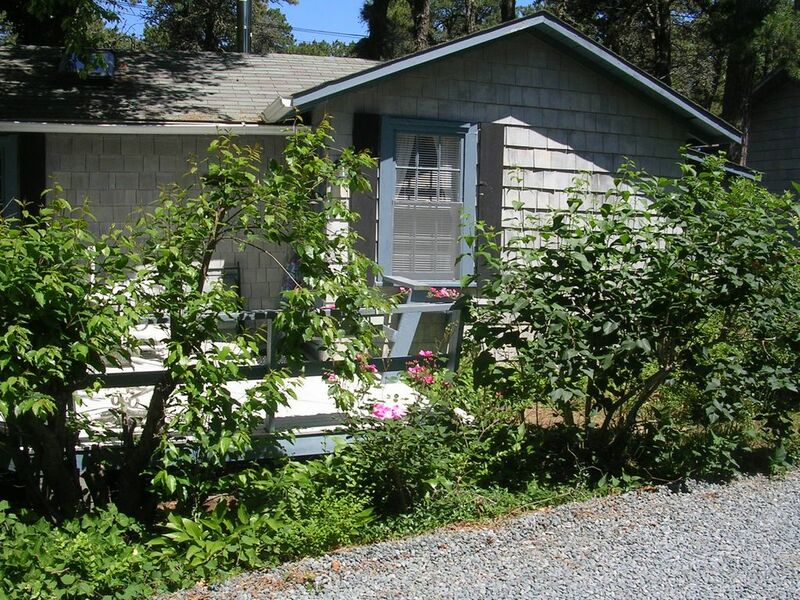 At this quiet lakeside cottage you can experience classic Cape Cod with all the modern amenities. Enjoy beautiful sunsets as well as swimming, kayaking and canoeing at the lake---and only be a short trip to the beach or Chatham center. The cottage features cathedral ceilings, a fireplace in the living room, new modern kitchen, and a large, bright bedroom with skylights. The living room has a futon bed, and the bedroom has a queen bed and a twin bed futon chair. (Note: Linens and towels are not included in price but can be provided for a $40 charge). From the cottage, walk 150 yards through a pine grove to White Pond. A kayak, canoe and beach chairs are included with the cottage. It is only 1 1/2 miles to Hardings Beach, a wonderful beach that faces south on Nantucket Sound, so it has calm, warm water. Other amenities include air conditioning, wireless internet access, color cable TV, and, AM/FM compact disc player,. There is an enclosed outdoor shower (plus a full bath inside)! The Chatham spur to the Cape Cod Bike Trail is just on the other side of the lake. The perfect place for your vacation! NOTE: Save 13% and rent before July 1. Late December, Massachusetts passed a law extending the taxes for hotels to all lodging rented after July 1, 2019. If you book for a period before July 1, you will not need to pay this 12.82% charge. May and June are beautiful on Cape Cod. The beaches are deserted and the town is quiet - and rates are lower to start with. Consider an early vacation and save!. However, the Homeaway app will charge the tax and I will need to manually remove it from your quote. Boston resident who loves Cape Cod and loves to share my cottage with others who love old Cape Cod,. . . but with all the modern amenities. Enjoy classic Cape Cod with all the modern amenities! Lovely lake to kayak, canoe, fish, or just sit by and enjoy! 200 yards from fresh water lake. Walk 40 feet behind cottage to view lake. Single kayak and canoe provided with rental. No extra charge. From the moment we arrived we could see the care and thought you put into remodeling, decorating , and providing everything a vacationer needs for a stay at the cape. From the Futon cover and lobster pot coffee table too the Canoe on the pond We couldn't of asked for more. Your kind consideration over the tragic loss of beloved family member will always be appreciated. Pleased you enjoyed your stay. Glad I could accommodate during the time of your tragic loss. We had a wonderful stay at Helene's cottage. Great location for bike riding, swimming and canoeing. Our host provided many local areas of interest in the form of a binder, which was very helpful to us. Areas of interest included local restaurants, conservation parks, bike trails, beaches, and shops. The cottage had all the amenities one could hope for, including air-conditioning, fully equipped kitchen, cable TV and an outdoor deck with table and chairs. The cottage was spotless, had every modern convenience, and was more roomy than we expected. Although we didn't use the beach at the pond, the water was clean and crystal clear. Our host did a great job communicating all we needed to know, and was very involved in making sure our stay was enjoyable. So glad you enjoyed your stay! Hope you will return! A quiet summer cottage close to Chatham. Nice clean cottage. Outdoor shower awesome. Close to Chatham. Would definitely stay there again. Quiet. The pond is great to go canoeing and to swim in. So thrilled that you enjoyed your stay. Please come again! Great little cottage to relax and unplug. We really enjoyed our stay. The cottage was equipped with everything we needed. Great location, just wish the weather would have been nicer so we could have enjoyed to the lake. Thrilled that you enjoyed your stay at my cottage. Wish I could have done something about the weather! Please come again! Cottage set far back from the road, and about 200 yds from White Pond. Swim or canoe in this beautiful pond, or enjoy the great sunsets! 1.5 miles to Harding Beach, 1.5 miles to Chatham Center. l. Shorter rentals available May and October, but $50 cleaning charge may apply. Linens available, $20 2. 3% fee for credit card transaction. Payment by check preferred.